Journeys Lesson 23 & 24 Short & Long /oo/ - Hook It or Goo It! This is a powerpoint that lists the spelling words, high frequency words, and vocabulary words and definitions to review with students from the second grade Journeys story "The Goat in the Rug". This can be used to practice the words whole group or even as a small group in centers. This is a literacy assignment to use with Journeys lesson 23 The Goat in the Rug. This trifold covers all 5 literacy domains everyday. Skills include: Conclusions, suffixes, rate, fluency, and multiple-meaning words. Journey's-Lesson 23-Goat in the Rug-Vocabulary Powerpoint - 2nd gr. This is an educational way for your students to learn and review the vocabulary words from The Goat in the Rug. This is a first grade reading assessment that I created from Journeys lesson 23. Assessments 1-20 are also available. I suggest copying it front to back. I will post each test through 30, as I edit them. 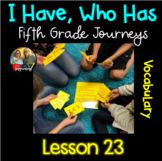 I use this activity after students have used the sequence cards that go along with Journeys. I do this weekly to reinforce reading with a purpose. I have student write a number on the cards as they go through the text either independently or as a group. These plans are for use with the Journeys reading series lesson 23 The Goat in the Rug leveled readers. Skills covered are: conclusions, rate, suffixes (-y, -ly, -ful), syllables, and multiple meaning words. This is a test review for Lesson 23: The Ever-Living Tree from the HMH Journeys series for fourth grade. It includes all 10 comprehension questions plus 10 more questions from the English, Decoding, and Vocabulary sections of the weekly assessment. These are short answer written comprehension questions for use with the Journeys Lesson 23 The Goat in the Rug and the guided reading leveled readers. The skill covered is character traits. Whistle for Willie! Aligned with Journeys Lesson 23. NO PREP! 30 pages! Vocabulary 4 Square for Lesson 23 The Journey of Oliver K Woodman. Includes vocabulary in context sentence. Students fills in definition, part of speech, synonym and antonym and draws a picture.